One of my favorite meals in recent days involved Italian sausage from Almar Orchards in Flushing, Michigan. Every Sunday for the past two months, I have stopped by the East Lansing Farmer’s Market to pick up whatever looks good. And every time out I have taken a good, long look at the Almar Orchards pig products (bacon, bratwurst, sausage, etc.). I finally caved in and bought a $7 pack of frozen Italian sausage. It was expensive (about 3 times as much as Italian sausage costs when it’s on sale at Meijer), but it felt like the right thing to do. The gentleman who runs that particular booth is one of the coolest people I have met at any farmer’s market (though I don’t know his name). 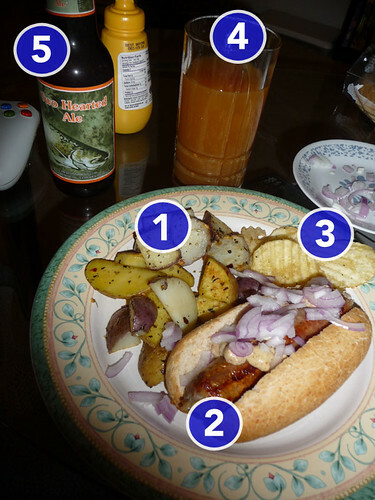 To accompany the sausage, I picked up some organic hot dog rolls from Foods For Living and prepared roasted potatoes from a farm in Dewitt, Michigan. Here’s a picture of this excellent meal; or you can hop over to my Flickr photo page for a larger version. (1) Seasoned roasted potatoes (mixed varieties) from a farm in Dewitt, Michigan. (2) Italian sausage from Almar Orchards in Flushing, Michigan topped with organic mustard from Meijer and diced red wing onions from the Wildflower Eco Farm in Bath, Michigan. Organic hot dog bun purchased from Foods For Living. (3) Kettle-brand salt & ground pepper krinkle-cut chips (all-natural) purchased from Foods For Living in East Lansing, Michigan. (4) Apple cider (organic) from Almar Orchards of Flushing, Michigan, purchased at the East Lansing Farmer’s Market. (5) Two Hearted Ale from Bell’s Brewery of Kalamazoo, Michigan.